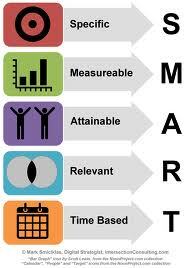 Most businesses have an objective, even if they don't know it. An objective is simply an aim; something that they want to achieve. So, for example, the main objectives for a new business will be to survive and then make a profit. Different types of businesses will have different aims. Private sector businesses will normally want to make a profit, attract more customers and expand their business by opening more shops etc. Public sector businesses, like the Army or the Police, however, will have an objective to provide a better service to the public. The following diagram shows what is meant by 'Market Share'. 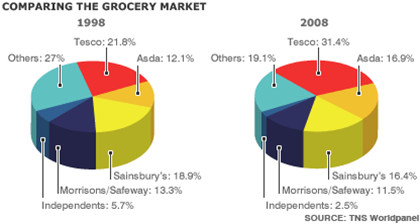 From the diagram, you can see that, back in 1998, Tesco only had a 21.8% market share. This basically meant that out of every pound spent in UK supermarkets, nearly 22p of it was spent in Tesco. However, probably because of their massive advertising campaigns, Tesco managed to increase their market share by 2008. In that year they had a market share of 31.4%, meaning that for every pound that was spent in UK supermarkets, over 31p of it was spent at Tesco. Great news for them - terrible news for their competitors! 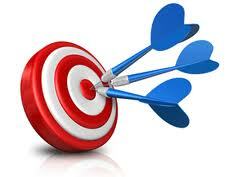 If you were to ask a business what their main objective is, they would probably say 'to make a profit'. But this is a poor objective. If they make a profit of just £1.00, will they be happy? They've achieved their objective after all. And what if it takes them 5 years to make that £1.00 profit? Similarly, it would be pointless for a corner shop to say that they want to make a profit of £10 million, as it would be almost impossible for them to achieve that. "Our objective is to make a profit of £2,000 by the end of this year." By doing this, the objective is SMART - that is to say that it is specific and measurable (because if they don't make a profit of £2,000, they have failed to meet their objective), it is attainable (which means it is possible to get a profit of £2,000), it is relevant (because we are talking about a shop making profit) and it is time-based (because the profit has to be made by the end of the year). Smart eh?! Take a look at some of these Mission Statements..